Carpenter ants are the most visible—and perhaps the most intimidating—of the wood destroying pests encountered in the Pacific Northwest. Anyone who has witnessed a spring swarm of Camponotus modoc reproductives emerging from a window sill in their living room or flying throughout the interior of their home can likely attest to imagining visions of their house about to collapse from the shear number of these insects. 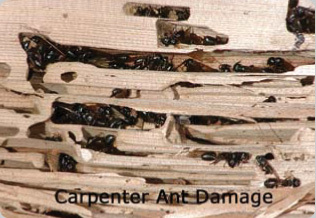 Carpenter ants can indeed do serious damage to structural members. Their primary interest in locating in a structure, however, is to use it as a nesting site. Carpenter ants do not eat wood, as termites or other wood destroying insects do. Instead they bore or mine wood out to create galleries to nest in and promulgate the colony. In fact, oftentimes a structural carpenter ant infestation may exist in or adjacent to the insulation of a structure rather than wood. They do not always seem to care what kind of material they nest in as long as it gives them the protection they need to survive and a relatively close proximity to a food and moisture source. The danger in their presence, no matter where in the structure they presently nest, is the risk of these ants moving into the adjacent wood where they can proceed to cause extensive damage as they expand their nest into wood members. Nearly a dozen different species of carpenter ants reside in the Pacific Northwest. They range in size from the small Camponotus essigi, (sometimes confused with other kinds of ants because of their small size) to the large Camponotus modoc and Camponotus vicinus; the reproductives sometimes found in excess of an inch in length. They can infest a structure by a singular fertile reproductive establishing a colony, which can take three to six years for the colony to mature. They can also infest a structure by an entire colony—whether a parent colony or a ‘satellite’ colony—moving from one location to another in a matter of hours (much as a swarm of bees might move from one place to another). They can be imported onto a property by delivery of organic landscape material from an infested site elsewhere or from firewood delivered from another area. Additional academic information regarding the biology and habits of carpenter ants can be obtained by clicking here. Corrective measures: Sanitary measures on site can play a large role in reducing the risk of carpenter ant infestation. Elimination of moisture problems in and around the structure is important. Not allowing vegetation to come in contact with the structure (either along the ground, siding, or roof) is vital. Inspecting firewood or landscape bark before delivery on the property, and proper siting of such material, cannot be taken from granted. In our experience, carpenter ants tend to give preference to such food sources as sugars produced from evergreen trees and shrubs, berry vines and bushes, ivy and other climbing and crawling ground covers. While they will also seek other food sources including other insects, most infested structures tend to have the aforementioned food sources in close proximity; thus attention should be given where possible to modifying such an environment to reduce the risk of infestation. 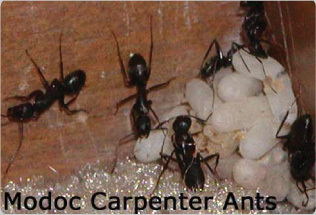 Once carpenter ants have infested the structure, controls are best left to the pest control professional. Many a homeowner or neighbor who has thought that they eliminated a carpenter ant problem with a home remedy has instead succeeded in spreading a colony into multiple locations or forcing a colony into moving to a more difficult site to treat. Colonies embedded in insulation, wood timbers, or flat roofs lacking attic access can be particularly difficult to eradicate. Leupitz Pest Control, with well over 44 years of pest management experience, can provide professional solutions to handle your carpenter ant problems.